At the recent Technology Salon on ICT for Cuba, experts came together to discuss the role of ICT in growing the Cuban economy and how the United States government, private industry and nonprofit organizations could help. The main takeaway I got from the event was the uniqueness of the Cuban system and that any company wanting to work in Cuba is going to have to play by their rules. Tech companies like Airbnb serve as a great example of how a company can adapt their current model to work within the Cuban system and work with one of their already successful industries. The way Airbnb has set up in Cuba is a good case study for how other prosperous Cuban industries, like the medical field, could use ICTs to grow the Cuban economy. Cuba has been compared several times to post Soviet countries in terms of its potential for the US government and private industries to provide assistance in helping to grow the economy. The biggest difference is that post-Soviet countries were also experiencing a major political shift. Throughout history most of these large economic changes have been accompanied by the demise of the country’s current leaders. This puts Cuba in a unique position, where current leaders are still set on maintaining the current political system and just making some changes to allow for greater economic exchange. The Cuban government has a centrally planned economy so most businesses are owned and managed by the government. They have begun allowing some small businesses to operate, but only within a few industries such as tourism, and permits are difficult to acquire. One of the biggest challenges is for companies to accept that their current operating models won’t work exactly the same way in Cuba. At the Salon, Cuba was compared to Alice in Wonderland. Some things work the way you are used to, but it’s a completely different world. For companies to be successful they are going to have to accept this and adapt their current models to fit within Cuban culture. Airbnb’s establishment in Cuba is a perfect example of how a tech company has taken one of Cuba’s already successful industries and adapted its business model to fit the local needs and culture. Cuba already had a very strong homestay industry, casas particulares, prior to Airbnb’s arrival, but it needed a few adjustments to become an AirBnB country. The primary challenges involve payments and internet access, but the country tapped into the casas particulares system that utilized middlemen. Because of the poor internet infrastructure middlemen currently manage most postings, but some renters utilize a new hotspot in Havana, and the government has pledged to open up 100 new internet cafes. Airbnb hosts can request to have a professional photographer take pictures of their homes and load them to the website. In most cases Middlemen manage the payments for Airbnb in Cuba, including delivering cash payments to renters at their homes. Airbnb sent teams of people to Cuba to conduct research, meet with homeowners running casas particulares and liaise with government officials. There are already more than 1,000 new listings for Cuba, but it will take some time to see the actual success of the company in navigating relations with the country. Early indications lead us to believe their model will be successful because of their active engagement with both governments to ensure they are following all U.S and Cuban regulations. In addition, because they are a platform they are able to avoid some of the messier sides of US-Cuban relations like importing goods, or disputes over property ownership dating back to the revolution when private property was confiscated. 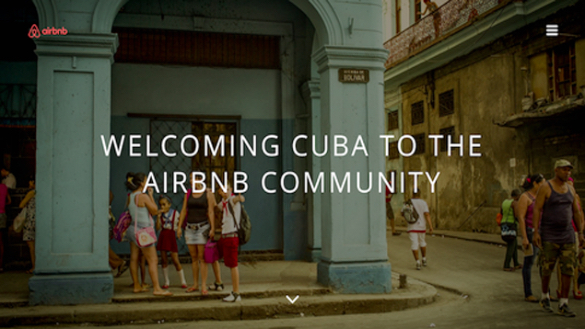 Still, AirBnB Cuba is already a success for the company and the country’s image. AirBnB has proven to be a very nimble company, has shown that US IT firms can enter the Cuba market, and is a great example of Cuban ingenuity, entrepreneurial spirit, and the greater market opportunity for ICT in Cuba. This bodes well for other IT industries that can take advantage of already successful sectors in Cuba, and help them expand and connect with the international community.